Quantitative analyst Vito Turitto on how the uptrend in Brent crude oil prices accelerated in late July in part due to increased geopolitical risk factors -- including escalating tension between US and Iran -- with the latter threatening to block the key choke points at the Strait of Hormuz, and healthy buying pressure felt from the Far East. However, summer demand is good, with the looming refinery turnaround season in Asia likely to limit the volumes of crude purchased by Chinese clients, which will undoubtedly affect prices during August. Welcome to The Snapshot -- our series which examines the forces shaping and driving global commodities markets today. The large drop in North Sea grades prices, although exacerbated by an aggressive selling pressure coming from speculative positions, was favored by an overhang of oil caused by sluggish South Korean and Chinese demand, American barrels still circulating in Europe and increased competition from Urals. The lack of Far East arbitrage caused several STS offers to be thrown into the market and the looming maintenance period in Asia certainly did not help to sustain prices in the first half of July. Things started to change around July 24 when some cargoes got booked to deliver oil in the East as a consequence of an extremely cheap EFS. The buying pressure on BFOE grades was also helped by a revival of domestic demand which contributed to absorb a good chunk of the floating barrels but the fact that Saudi Aramco suspended its oil shipments through the Bab el-Mandeb Strait in the Red Sea has, without a doubt, contributed to push North Sea crude prices up. Hence, the Dated Brent CFD forward curve remained in contango in the first half of the month but, in the second half, its prompt got in backwardation thanks to the renewed buying pressure. Internationally, the market sentiment changed from bearish to bullish on July 19 when the Saudi energy ministry reported that the "accusation that Saudi Arabia and its allies were aiming to substantially oversupply the market were without basis" and added that OPEC and non-OPEC producers were collaborating to "stabilize" the market. The uptrend in Brent prices accelerated over the last trading days of July also thanks to increased geopolitical risk factors like the escalating tension between US and Iran, with the latter threatening to block the key choke points at the Strait of Hormuz. The Volatility Premium averaged negative 26.3, over the month of July, which is significantly lower than its 3-month and 6-month values indicating that probably there will be a market correction in the short term followed by an uptrend. The Probability Distribution analysis shows that the Dated Brent monthly volatility closed the month trading above its equilibrium point so it is probable that the volatility will tend to move back down towards the 20-25% range where it has a more than 31% chance to stay. The drop in volatility will favor an uptrend in prices, although quick market retracements should be expected. 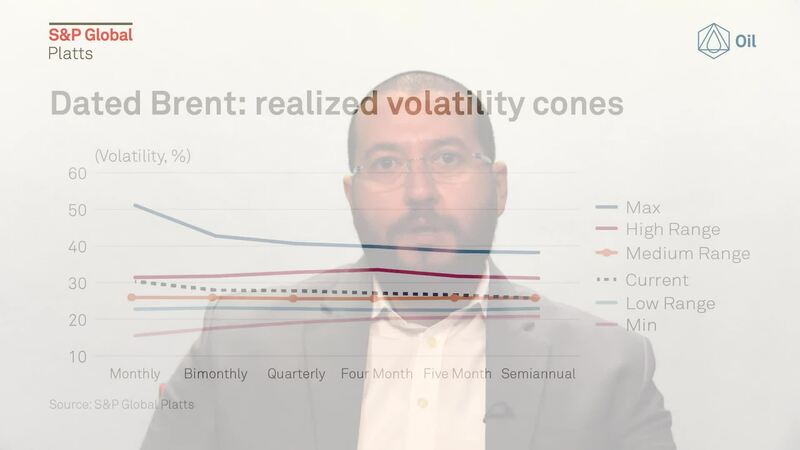 Finally, the Volatility Cones analysis confirms that the monthly figure of the current volatility curve is too high implying that the fluctuation rate will likely soften over the next weeks favoring a gradual uptrend of Brent prices. Nevertheless, price retracements, particularly in the short term, should not be ruled out.